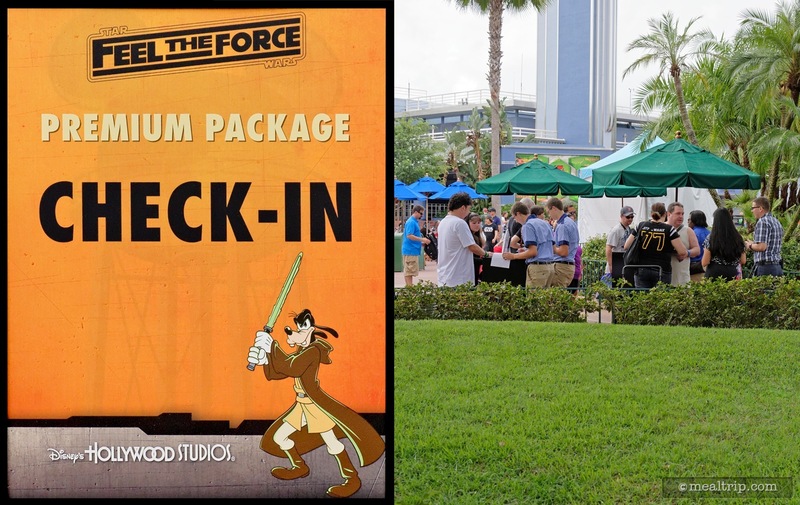 The "Star Wars - Feel the Force Premium Package" was a special event package available during Star Wars weekends and has several different levels. Two of the most common are the Premium (base) package and the Deluxe Premium package (priced around 25% higher). We are outlining the basic "Premium" package here, because it's contents are also included in the other levels of participation. Available on Friday, Saturday, and Sunday only, the Star Wars Feel the Force package is a great way to add some extra punch to your Star Wars Weekend experience at Hollywood Studios. For a full description of everything that's offered, we definitely recommend visiting the official Disney site (there's a link provided to the right that reads "Visit Their Site"). 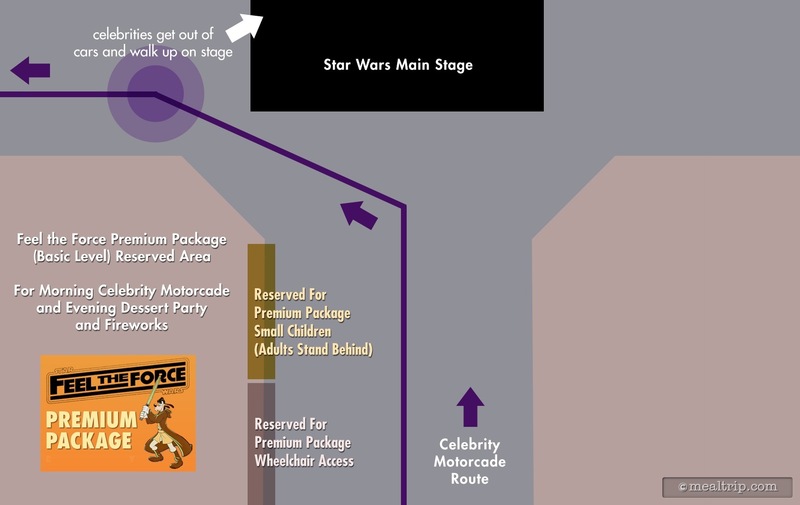 • A reserved viewing area for the Star Wars Celebrity Motorcade, with snacks and beverages. • Reserved seating for one of the Celebrity Talk Shows that day. for that night's Symphony in the Stars fireworks show. 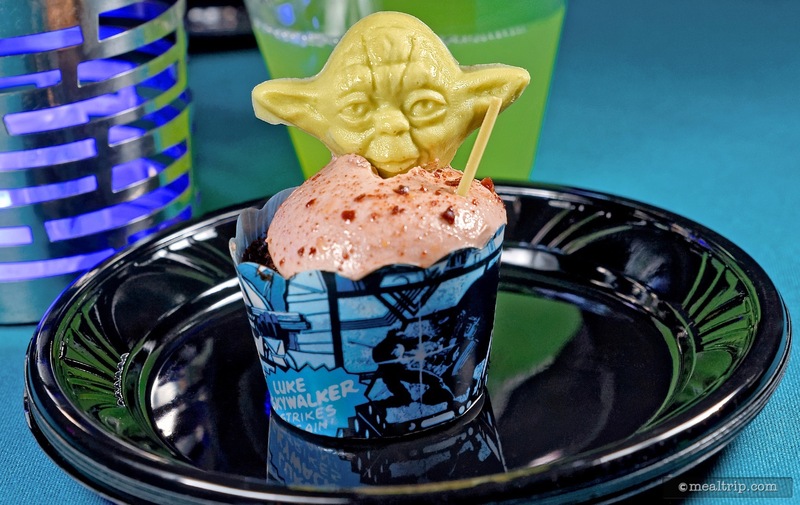 • A special Star Wars themed dessert party with "adult" beverages. The package officially begins at 10:00am and ends around 10:00pm, if you linger a bit after the fireworks have ended. The event is usually booked solid within a few weeks of it being announced, so reservations... are highly recommended. 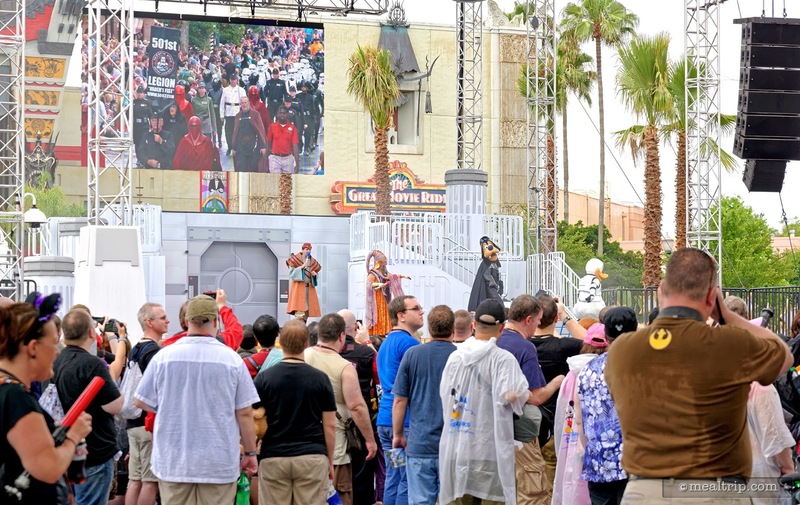 The "Feel the Force" Premium Package is a Hollywood Studios event that is offered on Friday, Saturday, and Sunday's only during the park's popular Star Wars Weekends season. I should mention that my experience is based on the "basic" premium package. There seems to be a "deluxe" premium package that is offered for roughly 25% more that the "basic" premium package. I'll try to point out the differences as best I can, but I have not been to the "deluxe" version of the package. If you're looking for a quick synopsis of the event, it is... what you make out of it. While there are a few "wow" moments, there are also a few detractors. That mix seems to leave some guests feeling like it is overpriced for what is being offering, while other feel it's a great deal. I go for the foodie bits, and because I can't resist a dessert party where there are bottles of rum and Baileys being mixed with, whatever that juice stuff is. But that's more toward the end of the day long event. Let's start at the beginning. 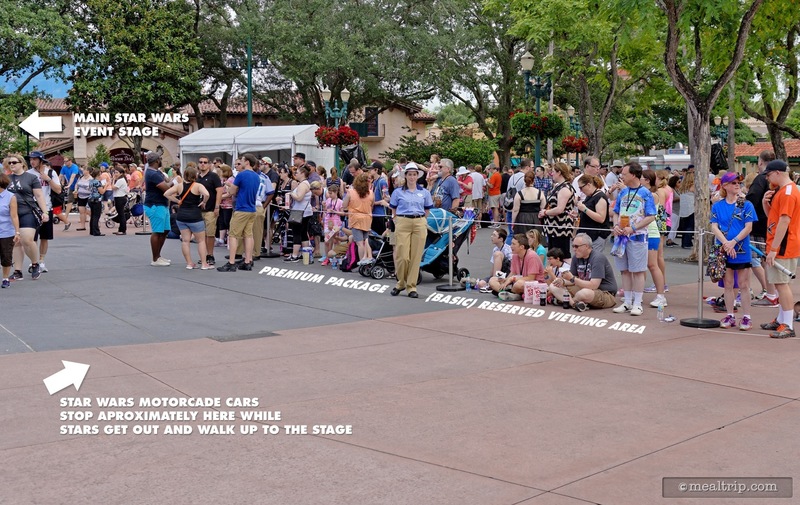 There is a small parade and "stars motorcade" that happens on Friday, Saturday, and Sunday (which for our purposes, is "Star Wars Weekends"). One of the first perks that the "Feel the Force Premium Package" offers is a reserved viewing area for said mini-parade, and some snacks and soda while this is going on. 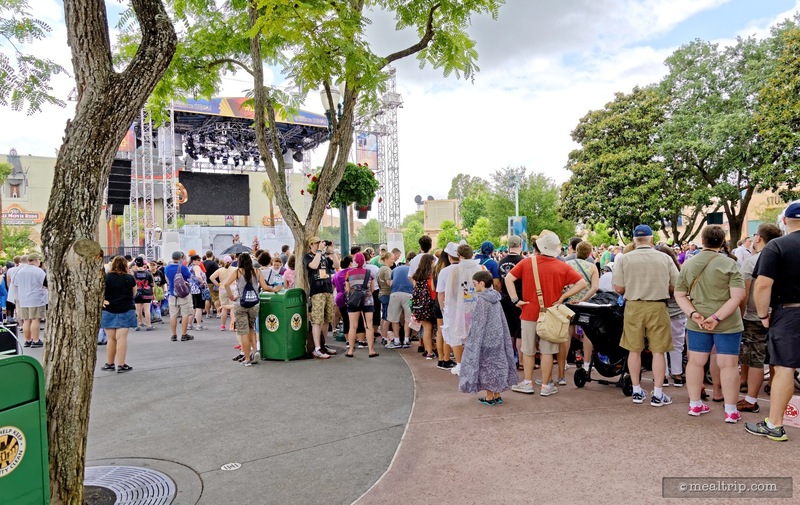 Anyone that has been to Star Wars Weekends knows that the parade route starts getting jam packed full of guests as early as 90 minutes before the parade begins. 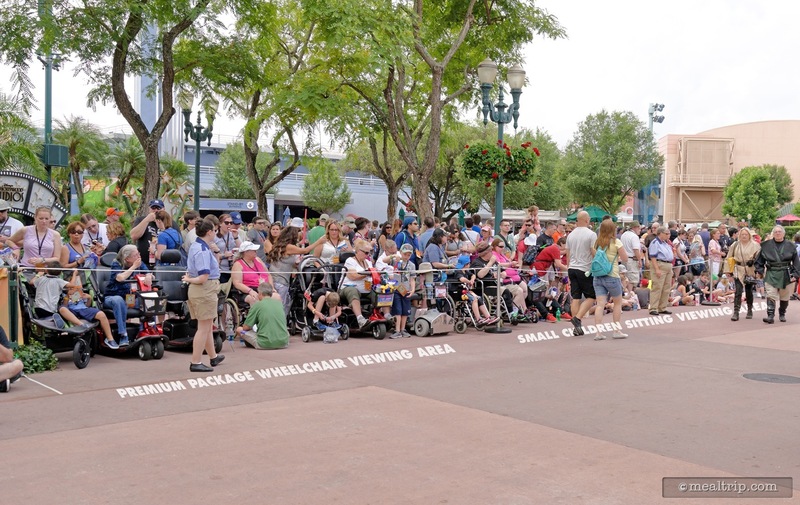 What many hope that the "Feel the Force Premium Package" will deliver is a Fastpass-like, sparsely populated, easy going spot to view the parade from. That however, is not the case. Many guests start lining up at Min and Bill's (the check-in point for the package) as early as 90 minutes before the premium event begins. Since there are more people, in a smaller "special reserved space", you may not get as good a spot inside the "special area", as you would just out on the street... in exchange for your 90 minutes. The Deluxe Premium guests seem to have a different area, that's not quite as crowded, more toward the front of the parade route. I have "seen" it from the outside, and it looks like there's more "on the line" breathing room. If anyone has been to that one, please leave a comment below and let us know what you think. Last year, I tried my best to get a "great" spot in the reserved area, and I ended up not having a very good time. It was hot, I waited in various check-in lines and on the street just as long as I would have if I were not a "premium" package guest. This year, I saw the mini-parade and motorcade a day earlier, as a "normal" guest… with the singular intent to eat my weight in free snacks during the premium package event… and had much, much more fun. 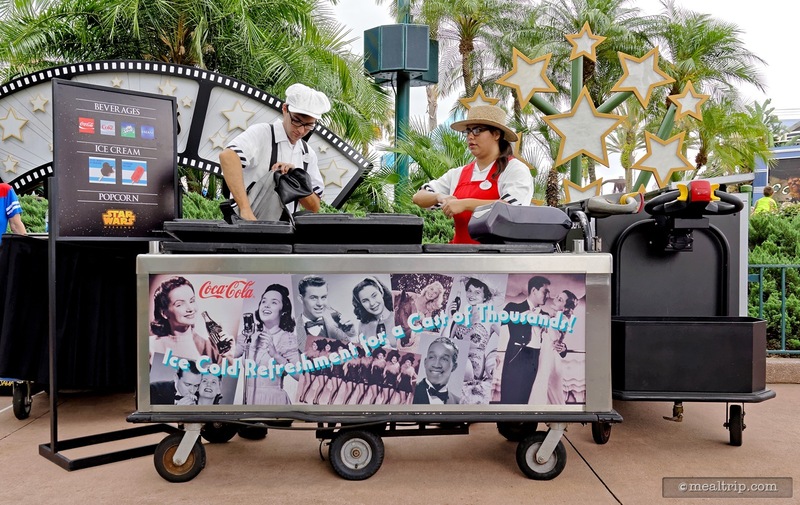 You see, there's a cart full-o-goodies that cast members are handing out in the premium area, and they seem to be just as happy not collecting money for the various snacks, as you are to be eating them. Between 10am and 11:30am that day, I ended up eating one Strawberry Juice Bar, drinking two sodas (water is also available), enjoying two boxes of buttered popcorn, and three (yes, three) Premium Mickey Ice Cream Bars. Not that I'm counting coins here, but my best guess is, that's close to $30 worth of stuff... 2,300 calories… and a great breakfast (which you should only enjoy once a year, because I don't want to promote unhealthy eating). You may also notice from the photos to the left, that it was an overcast day, which included about five minutes of rain. If that happens, you basically get wet, as there is no back-up plan for the daytime parade portion of the event. If it's raining, they won't start the parade, so our little ice cream and popcorn snack party will happen in and around when the parade happens. Make sure you talk to an event staffer to find out the "rain delay" details if it happens to be stormy on the day that you attend. Next up, the Standard Premium attendees get reserved seating for one Celebrity Talk Show, while the Deluxe Premium attendees get reserved seats to ALL of the Celebrity Talk Shows (which this year, are being held in Beauty and the Beast's "Theater of the Stars"). The seats are good, and this is one part of the package that will save you some time, if you were planning on going to one of the Celebrity Talk Shows. It's important to point out though… you have to select which Celebrity Talk Show you want to attend when you pick up your credentials, way back in the morning, before the parade begins. Since there are usually three Celebrity Talk Shows and the Standard Premium group gets split evenly between these three shows, you should plan on standing in that check-in line for that full 90 minutes. The reservations are on a first-come, first-serve basis. The "Deluxe Premium" package guests do not have to worry about getting into a specific show, as they get reserved seating for all three. If seeing all three of these shows (and having a decent seat for them all) is a big priority for your group, the Deluxe Premium Package might be the best, no-hassle way to do that. 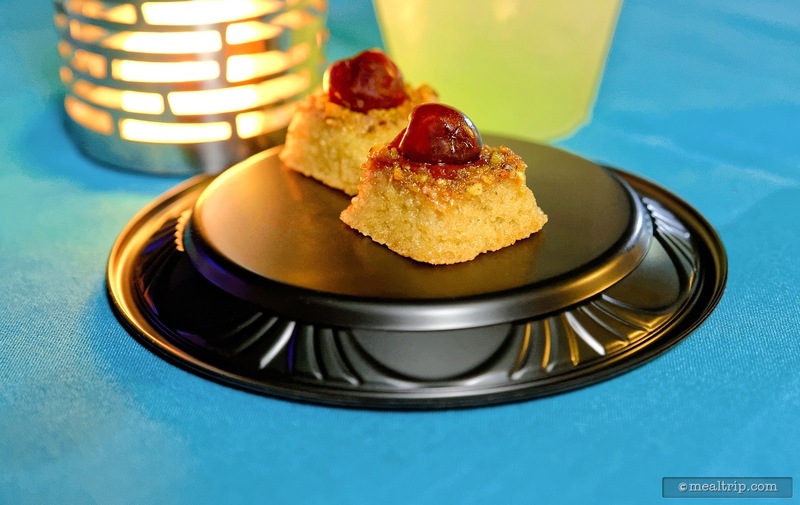 As evening falls across Tatooine, (or 7pm hits Hollywood Studios anyway), the rum and sugar party, ummmmm…. a Star Wars themed Dessert Party gets underway. 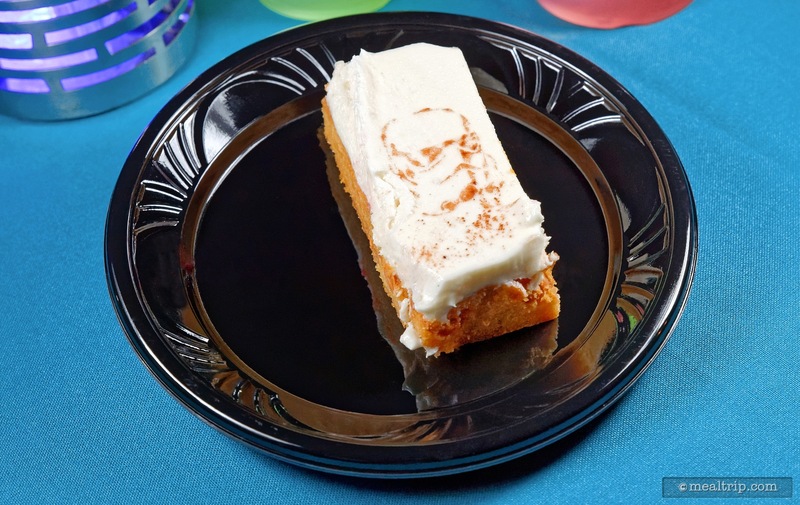 Held in the same location as the daytime parade viewing and snack area (but made just a little bit larger), this standing room only dessert party is complete with DJ Lobot spinning electronica tunes from the Star Wars universe and beyond. 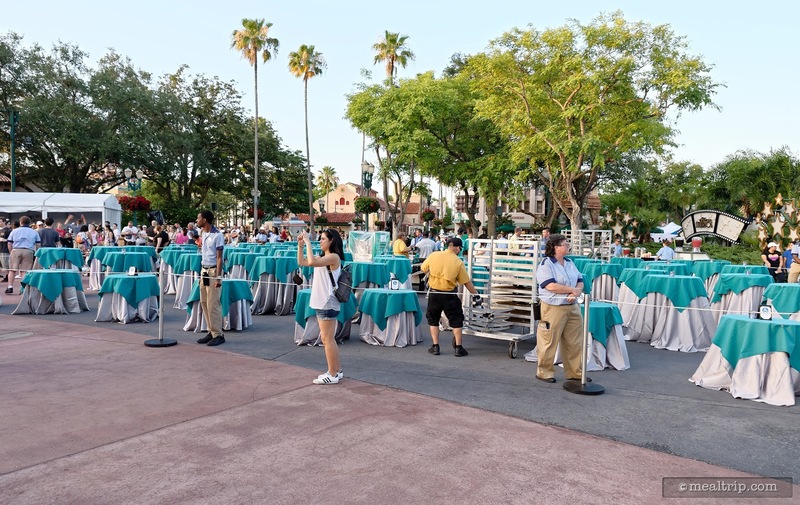 He's not just there for you, as a large portion of the courtyard is accessible to everyone, but still… the reserved dessert party location does seem to be just a bit less congested than the daytime guest area. As I mentioned earlier, there are three "adult" beverages available, that seem to be about as simple as you can make a cocktail. Usually containing just two parts, they're not going to win any mixology awards, but still... you can sample all three, all night, until the end of the party. There is no last call... when the fireworks start, the drinks stop. It's something to keep in mind. "The Force" (the red/pink drink) is a pomegranate lemonade and bourbon, which seems to be a guest favorite. 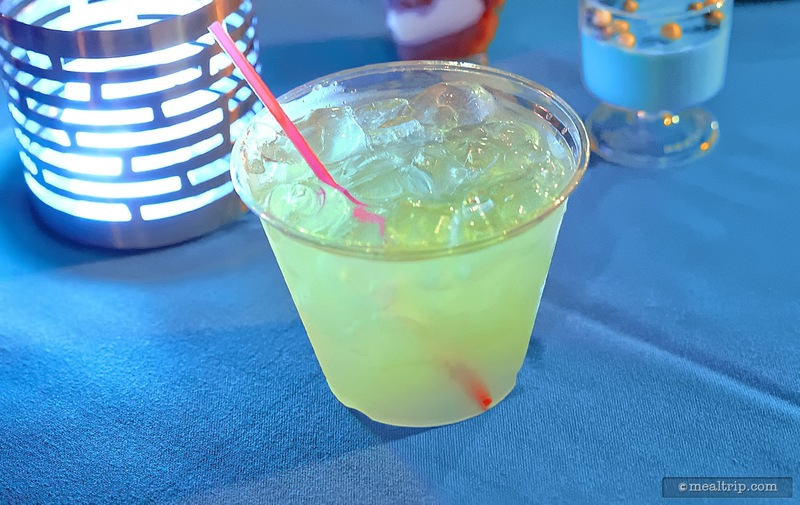 The blue/green drink is called "The Jedi Mind Trick" which combines apple lemonade with coconut rum. I personally, didn't think those two things went together too well… I'm not even sure what to compare that one to. 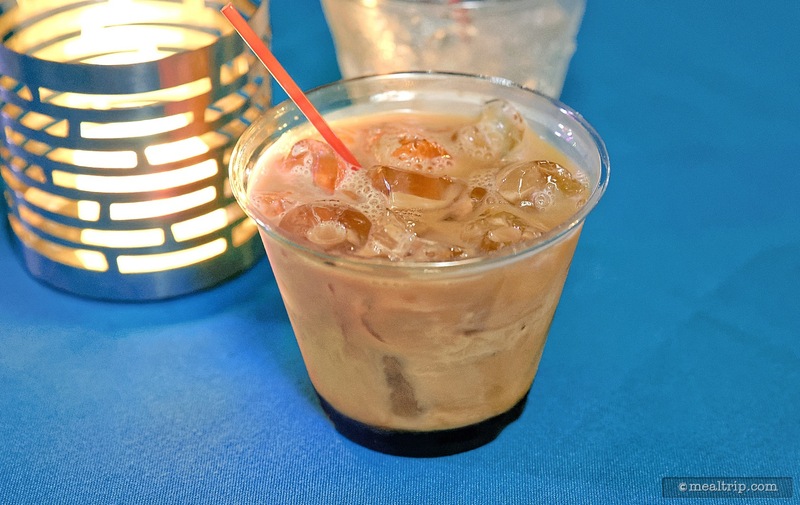 If you like coffee though, the "Dark Side" was a pretty stiff beverage… combining iced coffee, Baileys and Kahlua. Soda, water, regular coffee, tea, and nonalcoholic versions of the juice mixes are available as well. Many of the pastries at these Disney dessert parties are usually "small bites" or tart-sized pastries. Here again, you probably will not find a culinary "wow" factor in any of the morsels, but they are perfect for the format and fun. The "big three" here are the Darth, Yoda, and Jabba mini cupcakes, but after having seen them positively everywhere during Star Wars Weekend… I'm starting to question just how practical they are. The poured chocolate toppers that give each cupcake it's character are made from decent chocolate, but (and this is just a wild guess), they're probably not made from couverture chocolate (which requires tempering), but a compound "chocolate melt" type of deal. Basically, if you eat one... you're not moved to eat another... so many toppers just get pulled off and discarded. What you have left is a thick wax paper cupcake wrapper that you can't remove from the cupcake. My theory is, you are supposed to spoon out the insides. Since the spoons are the same size as the mini cupcake wrappers, you'll never fully get all of the cake and frosting out of the paper container. They are cute, and yummy... but a little wasteful and leave you with sticky frosting laced fingers. The Blue Panna Cotta was actually quite good. I'd prefer my cream to be aromatized with rum and not "berry blue" but it's not a deal breaker. 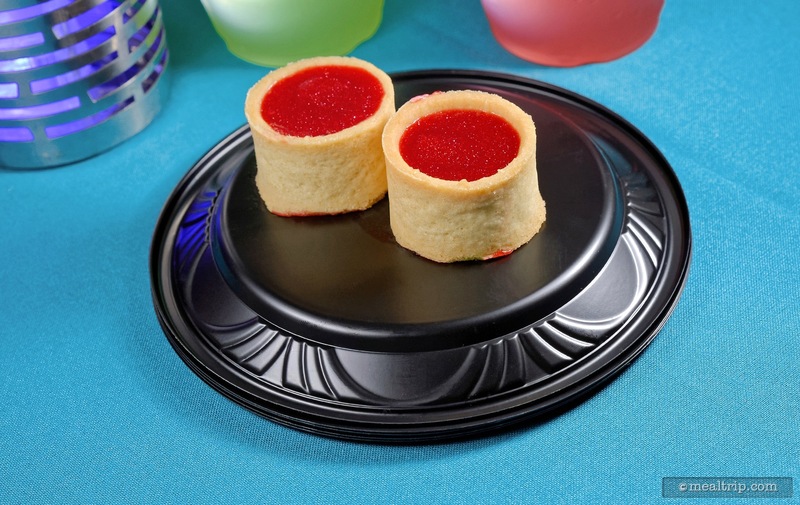 The Red Glitter Lemon Tarts are always a bit heavy on the "crust", but that's the nature of mini-tarts. The Carrot Cake Parfait and Salted Caramel Blondie with Cream Cheese were great. At first I thought the Blondie was a bit too sweet but it grew on me. It was more like eating a candy bar with frosting on top! The Florida heat and humidity (even at night) really hit the Blondie hard though. You really had to use your imagination to see the Stormtrooper that was dusted into the cream cheese frosting. Frosted Crispy Bon Bons were there in force. 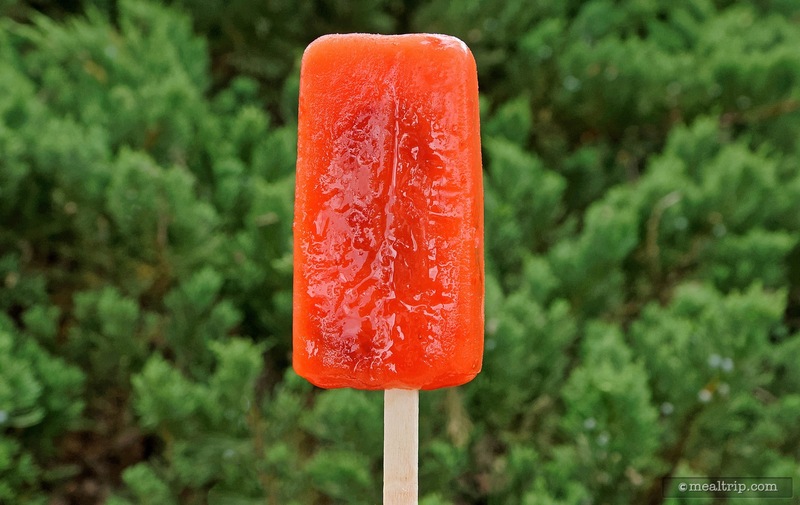 I know they're simple, but I love them for their portability… a great finger food dessert. If there was a "surprisingly good and creative" award that I could give to an item though, it would be split between the Pistachio Bite Cake with Morella Cherries and the Double Chocolate Dome Bite Cakes. Both had two different texture and flavor profiles. The combination of pistachio and cherries might not be everyone's cup of tea, but it was probably the most original dessert there. An ice cream cart was there as well, stocked with more frozen treats than what had been available in the morning portion of the event. In addition to the Premium Mickey Bars and Juice Bars, Frozen Chocolate Dipped Bananas were available, and possibly Mickey Ice Cream Sandwiches, but those went fast. Right around 9:30pm there's a little on-stage presentation of Star Wars characters, hosted by James Arnold Taylor, whom apparently lives in the park from Friday morning until Sunday night for five weeks solid (I hear he sleeps in one of the cars at the Sci-Fi Dine In). At 9:40pm-ish the Symphony in the Stars kicks off (i.e. the Star Wars Fireworks). It is a great fireworks show for Hollywood Studios, the Star Wars soundtrack synced together with the fireworks make for a great combination. While the dessert party vantage point for the stage show intro, is great… the Star Wars stage itself, looms large in front of the fireworks display. You are extremely close to the firework action though... so it depends on what you are looking for out of the experience. Some guests would prefer to be down the street more, and looking straight on and over the main stage. I for one, think that it's fine for fireworks viewing, and definitely less crowded than the general viewing area outside the ropes. After the fireworks have ended, you may be able to grab a last plateful of desserts, but the "bar" area is closed. The other beverage stations remain available for five minutes or so after the fireworks. While there is no push to get out of the space, it's pretty clear that the event ends when the fireworks end, and not having any seats, doesn't make lingering too appealing. All in all, I liked the event better this year than I did last year, because I went into it with a different mindset. If you are looking for a great parade viewing spot without any waiting, the standard ($69 per adult plus tax) Feel the Force package may not be what you're looking for. The "premium" Feel the Force package ($99 per adult plus tax) may give you a better view of the parade, and reserved seats for all three Celebrity Shows that day. It seems like it's worth those extra $30 if those things are important to you. 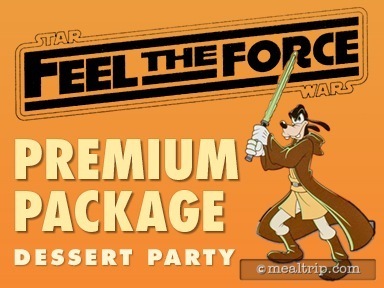 If you just like attending the evening's dessert party and having a semi-decent spot to watch the fireworks, with tons of baked goods and a few "adult" beverages, the basic Feel the Force package is a pretty good deal… especially if you can eat three Premium Mickey Bars in the Morning! CLICK HERE to view all 39 images in our photo gallery.